Nori's goal is to make it as simple as possible to pay for, and get paid for, carbon removal. Carbon removal is necessary at this point above and beyond emissions reductions, but the financial infrastructure has not evolved to take this into account. Additionally, we're all quite spoiled at this point and want online experiences to be as seamless as Amazon or Uber. Buying or listing offsets are decisively not as seamless as Amazon. The deals are typically bespoke, expensive, and fraught with middlemen taking their cut. One our advisors David Addison likes to say, “philanthropy can move millions of dollars, governments can move billions of dollars, but only healthy markets can move trillions of dollars.” And that is what is needed to remove trillions of tonnes of CO2 from the atmosphere. We are building the market infrastructure that will make reversing climate change possible by creating the world’s first marketplace dedicated to removing CO2 from the atmosphere. Our marketplace creates the first universal, market-driven price on carbon removal. 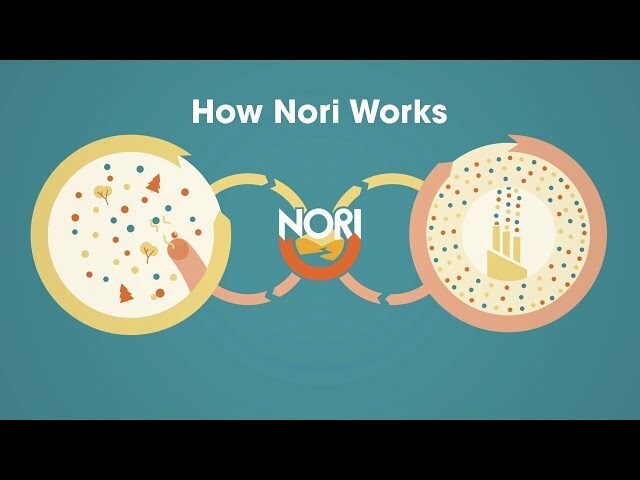 Because one NORI token pays for one Carbon Removal Certificate (CRC) which equals one tonne of CO2 removed, the price of the NORI token could become a global reference price for the value of removing carbon dioxide, akin to the West Texas Intermediate or Brent Crude prices that are so useful in forecasting in petroleum-using industries. This is perhaps the aspect of Nori which gets the team most excited. The lack of a true price on carbon has been bemoaned by nearly everyone paying attention for decades. By establishing a global market price for CO2, capital will be attracted that incentivizes new entrepreneurs and companies to invest in removing CO2. As the feedback loops take hold, more and more business activity will result in drawing down CO2 from the atmosphere. When reversing climate change is profitable, that's when we solve the problem. There are already many viable ways to remove and store CO2 from the atmosphere. We are agnostic to the method, though we are starting with regenerative agriculture practices in North America that store carbon dioxide in soils. These practices, such as cover cropping, complex crop rotation, and reduced or no-tillage, improve soil health and fertility, thus diminishing the amount spent on economic inputs to farming such as synthetic fertilizer and gasoline for plows, etc. We have a pilot underway currently for North American growers, but intend to expand globally as soon as possible. Crucially for this challenge, putting a market-driven and universal price on carbon removal benefits the Global South proportionally more due to differences in costs of living. A regenerative farmer in a country that ranks lower across key developmental indicators receiving $10/tonne (for example) of carbon dioxide removed is much more valuable than $10/tonne in Iowa. We are thrilled at the massive opportunity the Nori carbon removal marketplace could offer for some of the world’s most economically and climatologically vulnerable people.